Meet Ta’kaiya Blaney. At 12 years old, she’s the face of the newly unleashed chapter in the movement for climate justice. This past weekend, over 1000 youth and elders converged on the unceded Coast Salish territories commonly known as Victoria to participate in the biggest climate summit in BC history. 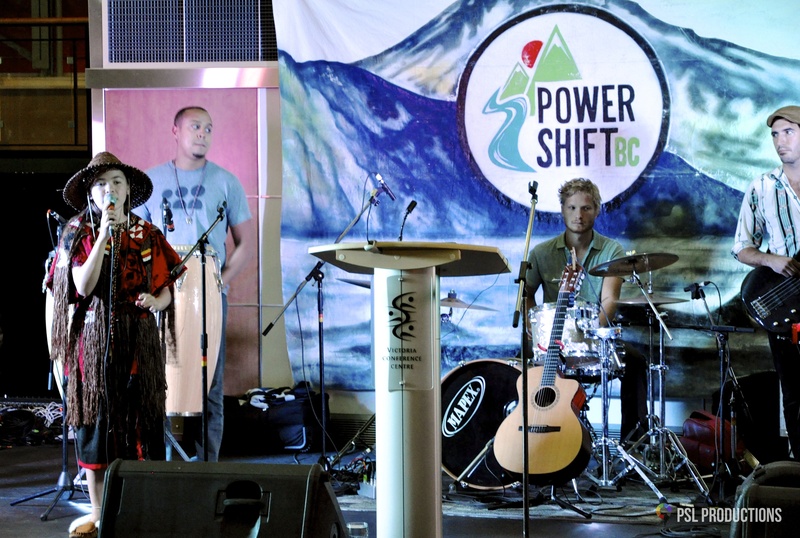 Though many who attended the opening night of PowerShift may have been drawn in by the chance to listen to David Suzuki, it was Ta’kaiya who won everyone’s hearts. From the Sliammon First Nation, Ta’kaiya captivated the crowd with her remarkable voice, singing an Indigenous welcome with her aunt Rose Henry, a local Indigenous activist. With steady strength, Ta’kaiya spoke of her own motivation to protect the lands of her ancestors from toxic pollution. She ended the night by belting out her own original songs like “Earth Revolution,” backed by Vancouver-based band the Boom Booms in an example of what can be possible when Indigenous and settler energies are joined in creative solidarity. The event was far from perfect, of course. But PowerShift was built on the recognition that this movement must be Indigenous-led and anti-racist at its core. Not only is it simply the right thing to do based on the historical dispossession of First Nations, but there’s a recognition that their rights and title are increasingly the only legal force standing in the way of more dirty energy projects in BC. So we listened to youth voices from the front lines in the north. Voices like 19-year old Satsi Naziel, who has been successfully blockading pipeline development on her ancestral territories by building a community with traditional pit houses and permaculture gardens at the Unist’ot’en camp. Or Caleb Behn, a young Dene hunter who went to law school to fight dangerous fracking operations in the northeast, now ironically silenced from telling much of what he knows about the industry as a result of his career choice. Or Melina Laboucan Massimo, a Lubicon Cree who witnessed the destruction of her lands when 4.5 million litres of oil spilled into its wetlands and river systems, exacerbating the epidemic of rare and unusual cancers and other health problems faced by her community as a result of tar sands development. Melina lost multiple women in her life this year, including her little sister, to the violence against First Nations women that is a sad reflection of structural injustice and the violence reaped on the land. As we bustled from one workshop to another on the UVic campus, I couldn’t help but think about these stories. I was uplifted to see so many youth younger than myself at PowerShift – not just the “usual suspects,” but many privileged high school students and undergrads wanting to get involved, a large number of whom were obviously being confronted with the idea of decolonization for the first time. This was one of PowerShift’s real successes. Another of PowerShift’s real successes was the diversity of content. I gravitated toward the skill-building workshops, which included topics like non-violent direct action, community oil spill response, investigative journalism, working effectively in organizations, and practicing self-care. All pretty positive-sounding. But I found that even in these kinds of sessions, which were meant to be empowering, a lot of energy was spent on problem identification, leaving little time to get down to business figuring out solutions. I met with my friends to debrief and compare notes. It seemed that this experience was a common thread. All the stories of destruction were wearing people down. It was a microcosm of the constant tension many of us feel in the work that we do: how can we strike a balance between being fighting against the urgent problems and working to build the solutions we so desperately need? There is no final answer to this question, only a lifetime dedicated to that careful dance. But ultimately I did find some answers at PowerShift that stoked my motivational fire. For one thing, it was clear that people want more permaculture, so I’m going to keep throwing my energy into building that community. For another, this weekend empowered me with the knowledge that I, too, could step into more of a leadership role, and I know others felt the same. The weekend ended the way it had begun: led by Indigenous women singing a women’s warrior song to the beat of their drums. But this time, they shared it with us. As a visitor on these threatened lands and as a woman angered by the authorities’ neglect of the countless missing and murdered Indigenous women from coast to coast, I was honoured to be invited to sing their song. 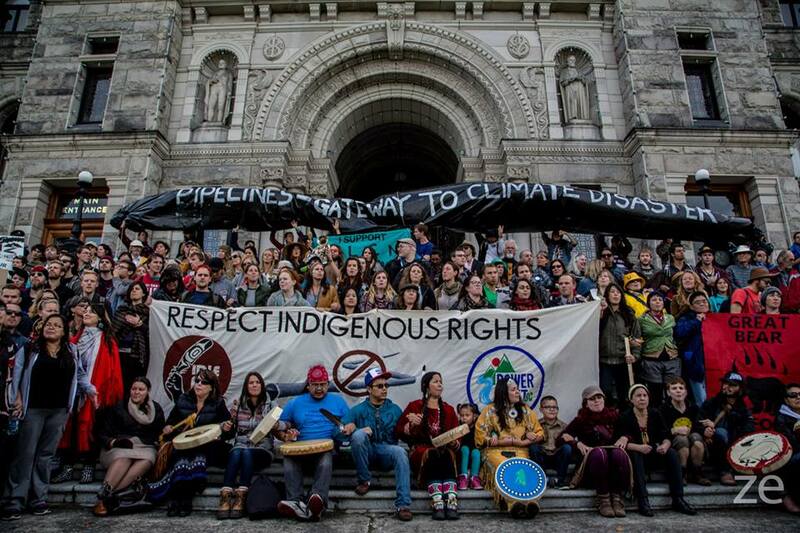 On the steps of the legislature, on the 250th anniversary of the Royal Proclamation of 1763, we linked arms to say “No” to pipelines, supertankers, tar sands, and fracking, and “Yes” to a new generation of relationship. Because it’s not a Right or Left issue; it’s not just a “Native issue”. As Maude Barlow and so many others insisted this weekend, it concerns every single one of us. Because we all drink water, and we all breathe air.